Camping – now there is an activity sure to divide. Camping with kids, well that is enough to terrify any parent. Pity, as it is the perfect way to get your kids to respect nature, help them overcome their fears and get away from our rather sanitised, screen-obsessed world. 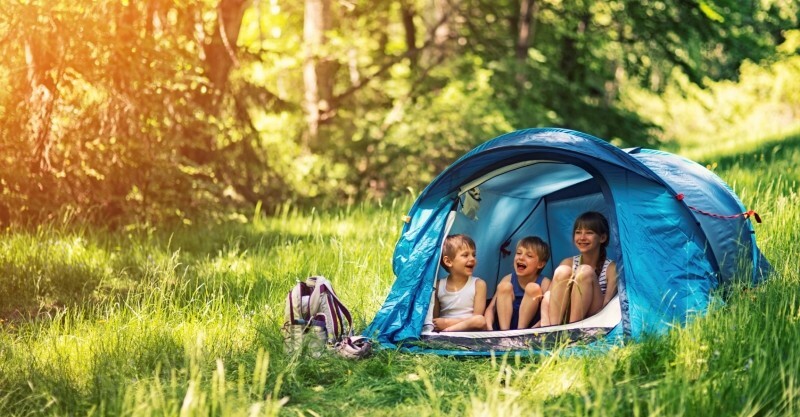 Making camping a success with kids is all about being organised, having the right equipment and having fun (doh). Get these right and you are (mostly) there. So how do you make sure it isn’t a total nightmare? Young kids and long car journeys simply do not go together. So don’t be too ambitious – choose a campground no more than a couple of hours away. For your first trip one night away might also be a good starting point. Baby steps, remember. Also plan to break the journey with stops for toilets, ice cream and to stretch those little legs. And did I mention snacks – an army marches on its stomach! If you are a first-time camper and looking to buy a new tent, go for one bigger than you think you need. My experience is that manufacturers use Hobbits when deciding on the capacity for their tents. So for a family of four you really need to look at six or even nine-person models. And to ensure everyone gets a good night’s sleep, opt for one with separate ‘bedrooms’ and a central ‘lounge’ or communal living area. The extra space is great for hanging out if it rains or for stowing gear when you go out for the day. Or if your kids are brave, get them their own tent to spend the night in. Camping really is about getting back to basics, so take a break from electronic devices and have fun like we used to. Take along a frisbee, ball, puzzle or books. Go fishing, hiking, canoeing or birdwatching. Take a dip in a swimming hole. You could even make a pretend fire – the only safe kind. 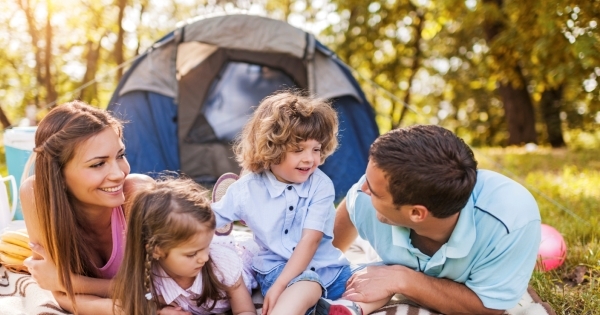 There is always something to do around a camp, so make sure you get the kids involved in all the chores. They will love helping to collect water, hammer in tent pegs, do the washing up and get everything set up. Enjoy the enthusiasm while it lasts, I find it evaporates when they get back home. When the sun goes down is when the fun really starts. Think grilling bananas, glow sticks or a wildlife safari by torchlight. And while sleeping under canvas can be exhilarating, nighttime fears are a reality you may well have to deal with. Pack familiar bedtime items – pillows, blankets or a favourite toy and give everyone their own torch to banish any worries. 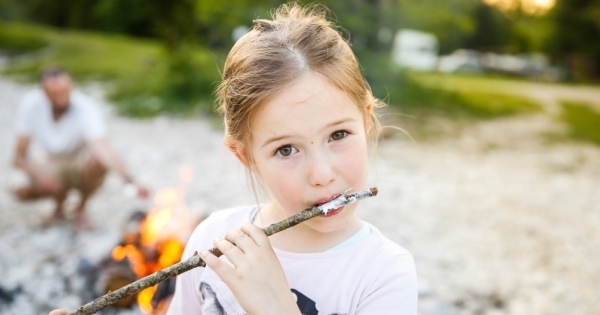 If the kids are old enough, this is when a camp fire for toasting marshmallows can be fun. Camping should be a memorable adventure, so make sure you capture it all. Better still, put your kids behind the camera for their take on it all. My eldest daughter even printed out her photos from our last trip to use for her weekly news presentation at school. Photos and videos also allow you to relive it all when you get home, and makes for a great bonding session. Leaving home without insect repellent, sunscreen, rain gear and warm clothing is asking for trouble. A small first aid kit is also a must. Grazed knees, insect bites and minor burns are all part of the experience. Our most recent camping experience featured a swarm of bees that descended on our campsite. We weren’t stung, but some of our neighbours’ kids were. Still not convinced? 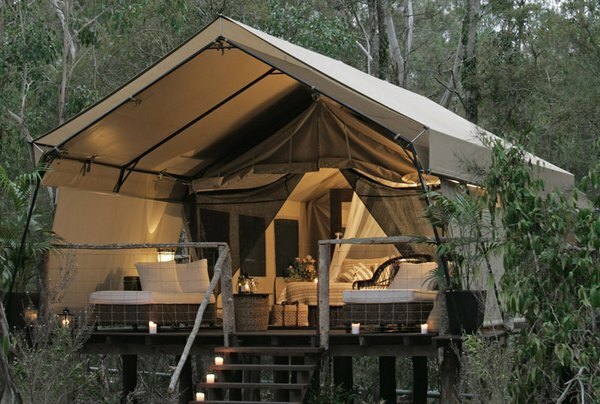 If you definitely can’t live without any of life’s luxuries then there is always glamping, but I bet you won’t have as much fun.